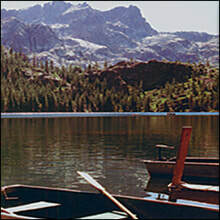 Sardine Lake and Sand Pond are enjoyed by both locals and tourists alike. Relax with refreshments in the boathouse and watch the fisherman fly-fishing while the sun sets over the Sierra Buttes. Later, fine dining is served in a log cabin complete with historic photos and memorabilia. This is just one of the mountain rustic resorts and great dining experiences available in the Lakes Basin recreational area which is accessed via Gold Lake Highway. Also try Graeagle Lodge, Packer Lake Lodge, Gold Lake Resort, and Bassets Station.